What better way to reflect on 2018 by reviewing each and every sunday message title from the heavens? May the knowledge and wisdom gain from God in 2018 bring you greater prosperity in 2019. In 2018, Taiwan, Christian Gospel Mission gave glory to God through a grand choir and orchestra performance. Praising the song, “Victory”, composed by Pastor Jung Myung Seok, the choir and orchestra weaved together brilliant melody and deep thankfulness into a masterpiece. Announcing the launch of conversationswith.life : a website dedicated to sharing reflective prayers and insightful conversations with the Holy Son. Why are humans so fickle? What is true excitement? How do we overcome overselves? Dive into conversationswith.life to find reflections on these topics! A rollercoaster journey revisiting the Sunday Message titles preached by Pastor Jung Myung Seok in 2017, Christian Gospel Mission (Providence). Happy Reflecting! Shaun McMillan, a professional animator and game designer from the United States of America, shares a testimony of Pastor Jung Myung Seok, whom he calls teacher or “son saeng nim” in Korean. Despite tribulations, why did Shaun believe in Pastor Jung’s teachings about the Trinity and why does Shaun continue to preach the word of Providence in his daily life? Taiwan’s EB TV network featured the testimonies of ordinary members in CGM (Christian Gospel Mission). Through the Word of God, numerous members testified of how they were transformed into unanticipated successes through the teachings and personal example of Pastor Jung Myung Seok. Taiwan’s BC TV network featured the testimonies of ordinary members in CGM (Christian Gospel Mission). An unassuming man from a humble village background, achieved the nation’s Outstanding Electrical Engineer of the Year award. A boy who lived in poverty later became a management consultant in the nation’s coveted Taiwan 101 at the age of 21. An indigenous Taiwanese scholar from the Luantian tribe who testifies about his participant observation of Providence and Pastor Jung Myung Seok. A female doctor who was healed of a rare immunity disease that debilitated her, after the prayers and personal guidance of Pastor Jung. Taiwan’s SETN news network broadcasted a heartwarming feature about Chinese Christian Youth Association’s (Christian Gospel Mission (Taiwan)’s youth arm) celebration of Mother’s Day in 2009. CGM’s children dressed up in cute animal costumes and performed for their mothers, followed by a personalized message of thanks to their own parents. CGM also organized outdoor activities for the families, such as a spring onion picking session in Yilan County. Through faith in God, families – the fundamental building blocks of society – are strengthened and unified. This then contributes to a strong and virtuous society. CGM’s Peace Medical Corp in Action! Christian Gospel Mission (Providence)’s Peace Medical Corp was established in 2005, focusing on the fundamental values of medical care, practicing Christ’s spirit of loving lives, and conveying love and peace through medical care all over the world. In this featured video, CGM’s Peace Medical Corp reaches out to special needs children in Harmony Home. These children have severe development challenges, which prevents them from communicating in a normal way even as they grow up. Despite challenges to earn the trust of these children, through regularly visits and a display of love for them, the children have began to trust the medical volunteers and have shown significant improvement in their social abilities. Even then, it is easy for medical volunteers to perform these acts because of obligation or simply as a routine. The volunteers breakthrough these keeping in mind the teachings of Pastor Jung Myung Seok, who has taught them that “The fundamental element of medical care is to love life. 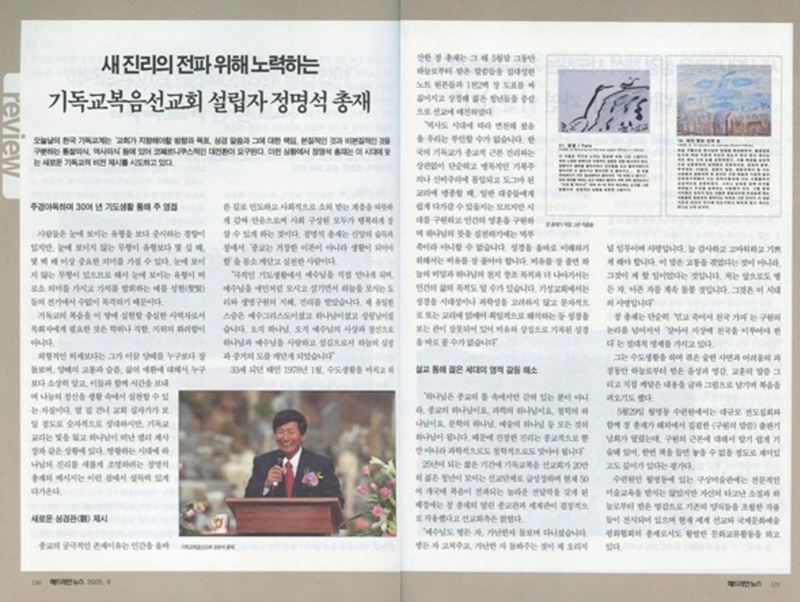 It is to restore the value of lives.” Therefore, the volunteers treat each life as a unique and irreplaceable person, and are reminded of the fundamental element of medical care that Pastor Jung Myung Seok has taught. These days, Christianity in Korea is in need of a big paradigm shift like in the days of Copernicus in terms of the goals and direction the churches need to strive for, the Word given to them in the Bible and the responsibilities related to it, their sense for history, and the ability to discern between what is intrinsic and what is extrinsic. In this kind of situation, President Jung is attempting to present a new vision of Christianity that fits this time period. Working during the day and studying at night, through the 30 years of his life of prayer, he received the Lord. Normally people tend to consider what is concrete and visible as important, but intangible things can have tens or hundreds of times more importance than what is concrete. There are cases when something concrete and visible only gains meaning and displays its value when it gains an intangible quality, which exists invisibly. We have witnessed these cases over and over from biographies of saints and the philosophers of the world. In order to actualize the gospel of Christianity on this earth, as a faithful worker or pastor, one does not need an academic degree, a title, or a fancy position. Instead of these things, what one needs is the ability to take care of one’s flock of sheep better than anybody else, a more clear and precise understanding of the sheep’s pain, grief, and life joys and sorrows, time to spend with one’s sheep, and the ability to actualize an open heart of giving in one’s daily life. In terms of numbers, the size of christianity is grand to the point that you can see a cross–a sign of a church–every 10 blocks, but the doctrine of christianity is losing its light and is in a situation similar to the high priest Eli whom God left. At this time when people are wondering about truth, President Jung’s message that illuminates the truth in a new way is very convicting. The ultimate reason religion exists is to lead human beings to a better way of living and teach people to embrace socially neglected classes of people so that all members of society can live happily. President Jung is a person who realized himself, in the process of learning about his life of faith, that religion should not be just a prodigious theory but a lifestyle, and he worked to actualize this realization in his daily life. When he became 33 years old in January 1978, President Jung wrapped up his ascetic life in the mountains and came down. He compiled the original notes that he wrote down from the Word that he received from the Heavens and made 120 pages of charts for months. That year, at the end of May, he packed the notes and the charts, went to Seoul, and devoted his ministry to evangelizing youths. “We can’t deny that history has been changing according to the times. If Christianity in Korea blindly obeys the doctrine, which has become a dogma to them, while focusing on mysticism and the simple and blind ritualism of asking for blessings, disregarding religious essential truth, it can easily approach the general public, but it will not be able to save thisgeneration, save human beings’ spirits, nor help people take action upon the Will of God. In order to understand the Bible correctly, we have to interpret the parables in the Bible correctly. Once the parables are interpreted correctly, the secrets of the Heavens and the purpose of God’s creation, and furthermore, the purpose of life can be understood. Christian churches view the Bible with an incorrect perception. They interpret the Bible in a singular and literal way, being bound to its doctrine without considering the pertaining time period or science. That’s why they cannot properly interpret the Bible, which was written with symbols and parables,” Jung said. Through his sermons, he quenches the spiritual thirst of the young generation. “God is not the one who is confined within the frame of religion. He is the god of religion, the god of science, the god of philosophy, the god of literacy, and the god of art. He is the god of everything. That is why the true truth has to make sense not only religiously but also scientifically and philosophically,” he explained. Within the short time period of 25 years, the Christian Gospel Mission has grown rapidly into a ministry organization where 200,000 young people have gathered, and they have currently spread the gospel to 50 nations. The Mission said that the deciding factor of their achievements thus far is President Jung’s open view of religion and the world. Its success hinged on this point. “Jesus took care of the sick and the poor. Healing the sick and looking after the poor was originally my job and mission. This work always has to be done with a thankful, grateful, and joyful heart. What I mean is that I did not suffer from doing it. It was my duty. Even in the future, I will keep taking care of the sick and those who are hurt. This is the mission I have during this time,” President Jung said. During his ascetic life, he went through so many situations and difficulties. During the process, he heard voices from the Heavens, received inspirations and word related to life, and realized many things personally, and he has been spreading the gospel and leaving it etched in history through his writings and drawings. At a big evangelism rally, a publication party for The Book of Salvation, which President Jung wrote while he was abroad, was held at the Wolmyeongdong retreat center on May 29. The essence of salvation is broken down in the book for readers to understand easily. Some reviews stated that the book was so fun to read while touching on profound truths that once the readers started to read, they couldn’t let go of the book. Even though he has never received professional art education, with the inspiration that he has received from the Heavens and the talent that he was born with, his art pieces transcend existing styles of art. You can see examples of his paintings displayed at the Gusang Art Gallery in Wolmyeongdong. He is also active in creating cultural exchanges as a chairman of the Global Peace and Cultural Union. This painting was drawn when Jung received an inspiration that brushed by his mind. The allegorical expressions relayed skillfully by the power of a brush stroke contains powerful messages. A snail is trying to climb up a cliff in the painting. He falls from the cliff but does not give up and climbs up again, and when he falls again, he climbs up again. After several attempts, he barely makes it to the peak and shouts, “Ah! I’ve finally made it.” However, just as he was about to take a rest, a stork walks up to him from behind and says, “Jackpot!” and goes to peck at him to eat him. This painting depicts the moment that determines the snail’s destiny. The painter depicted the image of God’s face with clouds in the sky, and conveyed the feeling within God’s eyes, which show that he is searching with fiery eyes for the righteous to see if there is even one righteous man in the world. The background is drawn symbolically: from the right to the left, you can see Namdaemun*, the National Assembly of the Republic of Korea, chimneys of factories, the Trade Center, the 63 building, the Twin Towers, a sun village* where wealthy people live, and a moon village* and a milky way village* where poor people live, which are located on the very top of a mountain and the closest to the sky. Also, in front of Namdaemun*, there are people who are worshiping idols before steles. The idol worshiper who is dark and has a tail is a monkey, which conveys the idea that idol worshippers are inferior than animals. It is the eyes of God, the Divine Being, who is anxiously looking for the righteous in the world. * In Korean, “sun village” is a name that is used to define an area where wealthy people live, and “moon village” and “milky way village” are names that are used to define an area where poor people live. Usually, moon and milky way villages are located high up on mountains since the price of those areas are cheap.